We notarize all types of documents. Notarization is when a notary public witnesses your signature in a document. 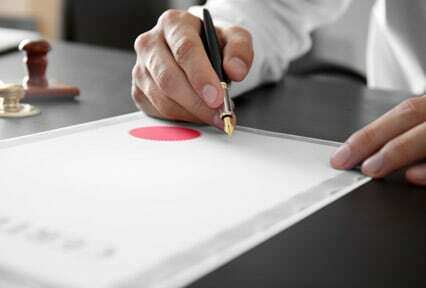 In doing so, notaries legally clarify that the imprinted signature actually corresponds to the person referred to as signatory in the document. It also means that the notary verified your identity and your understanding of the contents of the document you are signing. Can I sign the document and send it to be notarized with someone else? No, the notary must see you signing. Can I bring a photocopy of a document to be certified if I don’t have the original? Unfortunately, no. When the notary certifies a copy of a document it means that the notary saw the original and compared it with the photocopy; thereby the notary is able to certify the copy as a true copy of the original. What does the country from which I am sponsoring a visitor require along with the sponsorship letter in terms of supporting documents? We can draft a sponsorship letter for you but, in terms of supporting documents, we leave the responsibility with you to contact the appropriate consulate office or an immigration consultant to assist you, as we are not able to advise you on this matter.